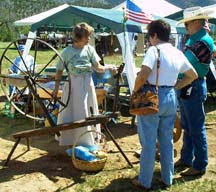 Someone asked me how to put her antique Walking Wheel together. It had been dismantled, boxed and shipped to her. It is completely easy. Lay all the parts to the wheel out on the floor. The first part to look at is the largest board, this is the “bed” of the wheel. Place it about where you want the wheel to be leaving about 3 to 4 feet behind it for you to walk around it and to spin back to. Now find the legs. There should be 2 the same and a longer one. Put the back legs in the holes in the bottom of the bed, lifting the bed up enough to slip them in. They likely are on a slant, so there will be a flat spot at the bottom for them to sit flat on the floor. Adjust so the back is stable and firmly on the floor. Slip the front leg into its hole. This should have the bed sitting at an angle, not flat on the floor. This leg also will have a flat spot on the bottom so it isn’t standing on its toe. Press firmly on the bed so the wheel is firmed against the floor. We don’t want it tipping over. Now we come to the wheel post. It has a large spike, this should be at right angles to the bed facing out at you. Put Vaseline on this and on the leather washer that is on the wheel post. No leather washer? Easy to fix, just go to the leather shop and get a scrap of heavy belt leather about 2 inches square and cut it round, in exact center cut a hole the size of the back of the wheel axle. Turn the smooth face out, but put Vaseline on both sides of it. Slip the Wheel on the axle and turn it gently. The wheel post should lean back from center and toward the back wall just a bit with the axle level. This is the angle needed to prevent the wheel from spinning off the post and axle and crashing on the floor. If it is properly angled it won’t need a pin in the end of the axle. Tensioner is some mechanism, that either slides and has a band across it and around the bed or it has a screw mechanism that pulls it to another post at the front of the bed. In the first case of the piece of lumber that has a band around it, slip the mother-of-all post into the hole on the end of this board. In the second case slip the 2 posts into their respective holes. These are the two types of tensioners I am familiar with. I have one of each. Now for the mother-of-all! It slips onto the top of the longest post at the front of the wheel with the whorl facing the wheel. There should be holes in the mother-of-all for the maidens to drop into. If it doesn’t fit tightly, get a small piece of lining leather and put a slim strip of it on the post then slip the mother-of-all over it and the post top. It must not turn freely. It must be tight. The spindle and whorls I have are the simple ones. One fits through holes in the Maidens and the other is tied onto the Maidens with corn shucks and linen thread. They both have the whorl directly on the spindle, which is a steel pin about 12 inches long and very sharp on the long end. The drive band should be made of rough cotton cord, which I cannot find in any store so I used crochet cotton size 10 or bedspread cotton and chained it to fit around the wheel and the whorl. This can then be tied together and stretched and retied till you have it the length you need for spinning. It needs to be waxed with beeswax.